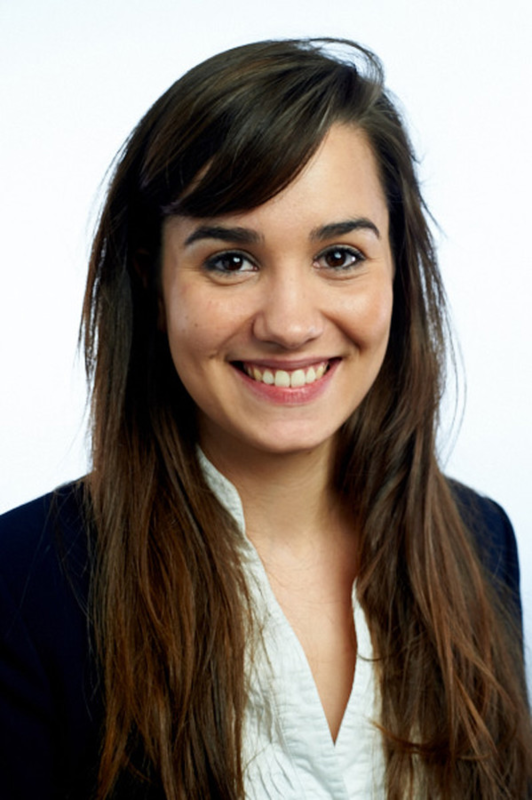 Charlotte Peleszezak is graduated in International business law and entrepreneurship from HEC Paris. Her professional thesis examined the link between open innovation and corporate social responsibility within large companies. 1) Hi Charlotte, could you explain the topic of your recollection, crossing open innovation with social innovation? Large companies are becoming aware of their role in the face of growing social and environmental challenges and are making these issues a strategic focus. Meanwhile, these organizations are also forced to deal with the “technological revolution” that is profoundly transforming the economy. In this context, the ability to innovate has become the survival condition of any organization. To take up these challenges, almost all major companies have gone through the process of “open innovation“. This means that companies open up and collaborate to innovate with multiple actors like other companies and startups, but also public structures, universities or their own employees. I chose to question the link between these two phenomena with the following issue: Can large companies better respond to societal challenges through open innovation? Of course, the positive impact should not be exclusively for the benefit of society but for the benefit of the company as well. 2) How did you come to the conclusion that social innovation is open by essence? Could you share with us a few examples? 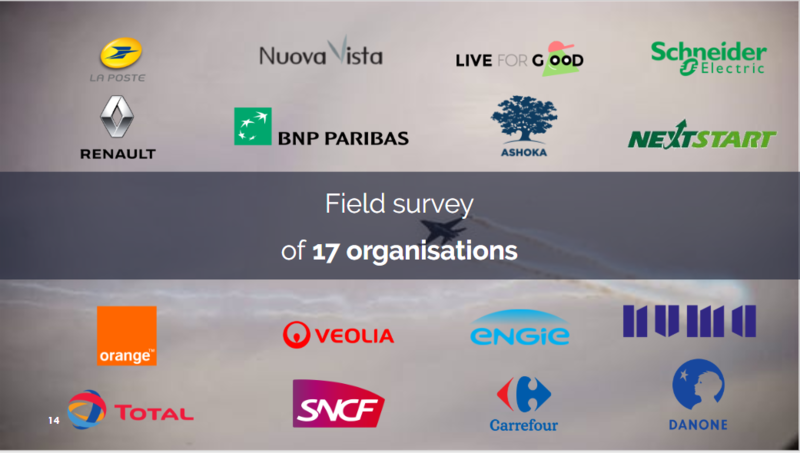 According to my field survey of 17 organisations, open innovation with societal impact is an emerging reality. The possible models of collaboration are varied and I have identified many societal initiatives in the form of « open innovation ». Among them, I discovered for example more and more incubators within large companies hosting startups with positive impact as well as corporate funds investing in societal projects. There are also many « co-construction programmes » between large groups and social entrepreneurs. Last but not least, there are also many famous intrapreneurs behind social business projects on a large scale. All of these are what I call « open innovation with positive societal impact ». This is explained by a double phenomenon that I have observed. First, companies are increasingly integrating societal issues into their open innovation programs ( internal incubators, startup and intrapreneurship programs..). At the same time, innovation at the service of society and the environment, particularly within CSR departments, is inevitably part of an open and collaborative approach. Indeed, when companies seek to innovate in societal matters, they are intrinsically in a process of open innovation. It is in fact necessary to consult stakeholders to solve our societal needs. This is explained primarily for reasons of efficiency but also legitimacy. 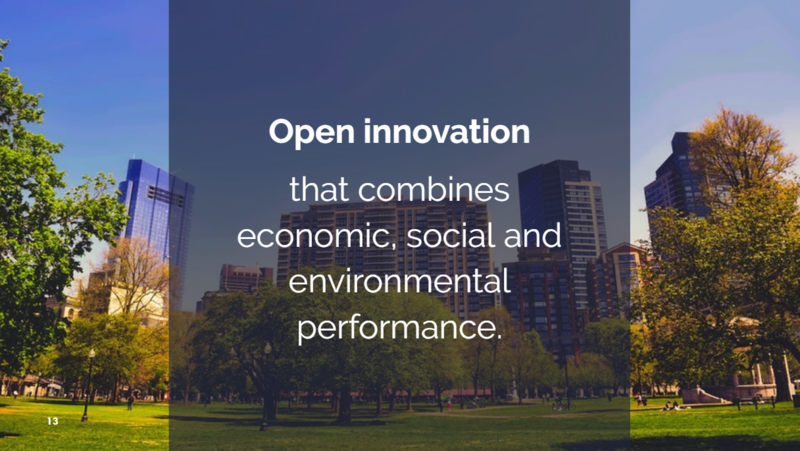 These two trends converge towards the advent of a new kind of open innovation that combines economic, social and environmental performance. 3) What are the benefits of social innovation for the business? How does it correspond to long term value creation? Can it impact internal transformation? 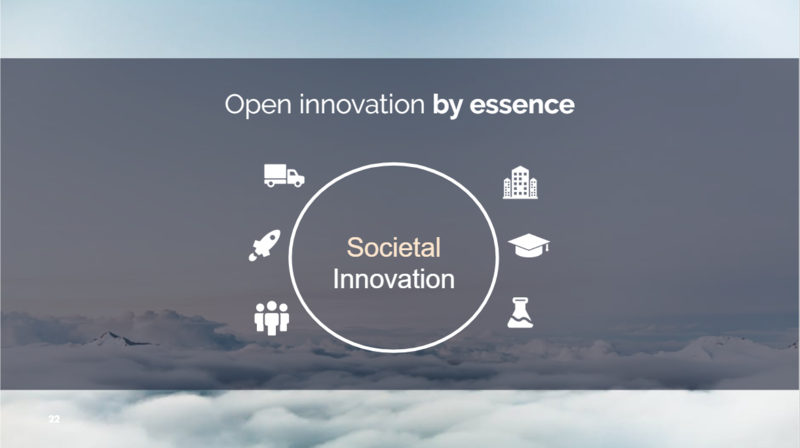 Through my field survey, I identified 5 main benefits of societal open innovation for the company. Adopt a long-term vision: open up to new markets or anticipate future needs, for example. Employees involvement: it is also the opportunity to respond to the quest for meaning at work that is strongly felt in large companies. New working methods: this new participatory approach for large companies allows them to open up to new methods. Innovation: Societal innovations are innovations that aim to transform the established system. 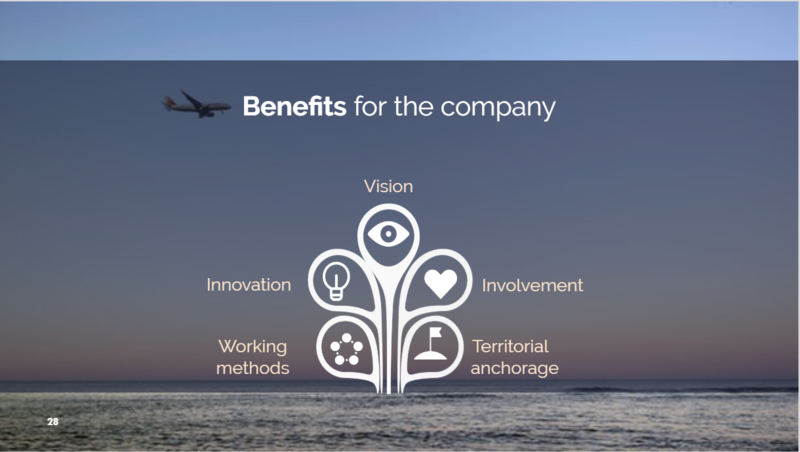 Territorial anchorage: open innovation with societal impact is by definition local, and it is a powerful lever in that respect. The idea of combining open-innovation and societal issues inevitably leads to questions of profitability. What needs to be measured is not simply immediate profitability but value creation for customers, for employees but also for the company itself because it guarantees its long-term sustainability. 4) What are your prioritary recommendations to implement social innovation? Professionalization: companies should communicate, and train their teams to know more about open innovation with societal impact. Building bridges between departments: regular collaborations between CSR and open innovation teams are still rare. The open innovation departments were generally conceived and thought to exclusively support the digital transformation of their company, and this evolution must involve a broader redefinition of their mission. In the same way, CSR departments must assimilate the innovative dimension that their actions must take to give them a greater scope. At the initiative of the company’s management: to scale up this change, it must also come from the management team who must become aware of the opportunities it offers for the sustainability of their businesses. Large companies have the power to link innovation and societal issues to harness collective intelligence for the benefit of all. 5) What are the next steps you imagine for your thesis work: how would you like to share your learnings (dedicated conference panels, breakfast events?)? and for your professional life, you’ve just joined Lecko, how do you see yourself in the next 12 months? I recently joined Lecko, a consulting firm in digital transformation that helps companies to readjust their way of collaborating using digital tools. Within my team, I am now planning to reflect on the possible links between my analysis and our activities at Lecko. I do believe that societal initiatives can emerge from collaboration. Digital tools makes it possible to spontaneously develop participatory innovation that will benefit the company and society. At the moment, these are only avenues for reflection but it is on this path that I am now directing my analysis thanks to this new experience.